In the old days, Ialysos (also called Trianda) used to be a vacation resort for the upper class of Rhodes, and there are plenty of impressive mansions of the neo-classic style still around the city today, complete with palm trees in their front yards, attesting to that fact. The area has been inhabited as early as the Minoan Era, according to archeological findings, which have increased its age for some thousands of years, back to prehistoric times. The city, birth place of the famous athlete Diagoras, winner of the ancient Olympic Games, developed around Filerimos hill, ruins of its acropolis and other monuments from ancient, byzantine and knightly times still evident around the area today. One of the most important landmarks of old in Ialysos is the temple of Athena Poliada, whose worship was carried on for at least 5 centuries (from the 9th until the 5th century B.C.). The basis block on which stood the statue of Athena Poliada is still in its place today, while the surrounding rocks are covered by carved signs of worship. After the 5th century A.D., the ancient temple morphed into Christian churches of various types to finally be turned into a monastery during the Venetian Rule. Another important remnant of the ancient past is the Fountain, which is thought to have been the city's main water supply medium. A water tank was carved on the top of the hill and the gathering water floated towards the city via two gutters, which ended up in faucets in the shape of lions' heads. There was even a law that helped protect the fountain from any vandalism and its rules were – literally – carved in stone right next to the faucets. If you are interested in religious history or just want to visit some noteworthy churches, be sure to include in your tour of Ialysos the Christian temples of the Assumption of Mary, Saint Nicholas and Zoodochos Pigi (Source of Life), as well as the underground 15th century church of Saint John Chostos, with its impressive murals. Carrying on with the religious theme, another impressive sight is the giant marble cross just outside the Knights' monastery of Saint Nicholas, as well as the 'Golgotha route' featuring 134 steps with representations of the Passion of Christ carved on the rock uphill. 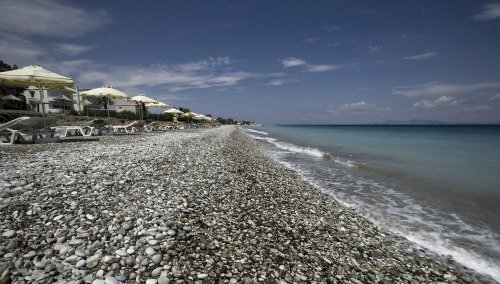 With a 10 klm stretch of beach, Ialyssos has traditionally been one of the most popular island holiday resorts in the Mediterranean, with its tourist development reaching its height as early as the '70s. Today, there are many high quality vacation & conference hotels stretched along the coastline, each taking up a part of the long sand and pebble beach. When the winds really blow, the sea turns into windsurf heaven, attracting amateur and professional athletes from across the globe, wanting to harness the mighty waves. For those not equipped (or foolish enough) to brave the windsurfing scene, the beach is organized with sunbeds, umbrellas and other, more tame watersport activities. Or you can just lounge, have a bite or drink and gaze accross the sea to the coastline of Asia Minor. If you are not swimming, then you can surely find a nice place to eat. There are plenty of eateries in Ialysos ranging from the easy and inexpensive snacks to the more gourmet options. If you happen to visit Ialysos in August, look out for the 'Ialyssia' festival, which includes a multi-cultural programme of music concerts, traditional dancing, book and art exhibitions and many other interesting activities. Ialysos is located along the main road axis of Rhodes, which connects the city of Rhodes with the Airport and the area of Kamiros. You may get there by renting a car or other vehicle from the airport or the city of Rhodes or take a taxi or a bus operated by D.E.S. Roda (+30 22410 26300).